Goodbyeee January! Anyone else feel like January lasted forever?! Yes, me too. While every January is cold and overall dull, it is the perfect reset month. It inspires you to get everything clean, organized and ready for the year. One of the biggest things I did this January was create a huge personal budget synched to my phone (for free!). I’m hoping to better my spending habits this year to save more money. I am no expert at budgets, so I thought it would be helpful to share how I did it for others wanting to try. Today I’m sharing a few ways I reset my life this January, and then tomorrow I’m welcoming February with big, open, red & pink Valentine arms! 1. New Planner! Starting the year out with a new, large and well organized planner was the best start ever. I went through and added important dates, trips and notes. I’m already feeling better about this year. See my full Planner Post here. 2. Deep Clean the House. After putting away Christmas decor and all the holiday get togethers, I felt like our house was so dirty. It felt great to clean up the house. Whenever I deep clean the house, I always do things that aren’t on my typical cleaning list. 3. Closet Clean Out. It’s no secret I have a shopping problem and after the holidays; my closet tends to be a giant disaster. I clean out and donate clothes I didn’t wear in the previous year, reorganize hangers, fold piles, shoes, etc. and clean/organize my jewelry. I also go through my purses and clean out trash, reorganize pouches, clean out my wallet, etc. 5. Yearly Budget. This is the one I’m most excited about and proud of. The other day I sat down and made a huuuuge budget. I mapped out my entire year of projected income, projected spend, what I should be saving and goals for this year. I wanted to walk through my steps incase you want to try this for yourself! -First, I made an excel sheet. 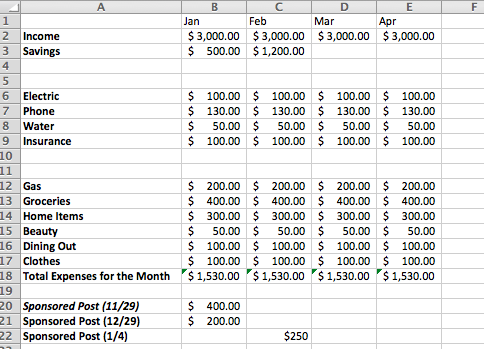 This was nothing fancy, but I started by listing what my monthly income was. I know this is different for everyone but I only list my fixed income at the top. Working as a blogger, there is a lot of ‘freelance’ income that varies from month to month. I didn’t want to include this in my budget because some months it’s a large amount and some months it’s nothing. I included this at the bottom of my budget with all extra income I send to my savings account. *This is just a made up budget to show you guys! For my savings formula I did (B2-B18+B20-21=C3). Once you have this formula set up for one column, you can highlight from B2-21 (or wherever your numbers fall on your first column) and drag the red triangle over all months to repeat the equation for the entire year! -Under my fixed income, I have a slot for projected savings. For January, I started with what is currently in my savings account. For February-the end of the year, I used a formula to auto calculate my projected savings. I did the Sum of my Income – Total monthly expenses + the previous months balance and made the number land under the months projected saving’s box. I did this by using the formula builder. -Below projected savings, I listed all the ‘required bills’ such as: electric, water, phone, etc.. I used past bills to estimate what is due. If unsure or it fluctuates often, I would round up. I would rather have extra money at the end of my month vs. feeling stressed. -Under that, I listed all the ‘optional expenses’ such as: gas, groceries, beauty (hair, nails, etc. ), home items, etc. Don’t forget to include monthly payments in here as well such as Netflix, Hulu, etc.. One thing I did forget was the dogs (AHH! ), so I’m adjusting mine accordingly. -A few other things to account for in your budget: birthday gifts, travel expenses, frivolous expenses, etc.. Whatever you like to buy each month! After creating my excel sheet, I then downloaded the free app Mint. I love this app because it connects to all your bank accounts, allowing you to see all your money in one place. It also can connect to different bills to create autopay. Once I had everything connected, I went to the budget section and used my excel sheet to set the budget in my app. At the end of every day, before bed I go into my app and make sure all the purchases I made that day fall under the right category. This allows me to quickly glance in my app and see what I have left for what budget. This is still taking a little bit to get used to, as I’m an impulse shopper, but technically I’m starting in February. 😉 It’s definitely a learning curve, but I’m hoping I can get better and better at budgeting and saving each month. I started this at the end of January so I didn’t have a guide all month, and my app says I went way over my budget for this month. #Whoops Tomorrow’s a new month, though! Do you guys have any budget tips for me? If you have any questions, feel free to comment below or DM me on Instagram (@YesPleaseDaily).